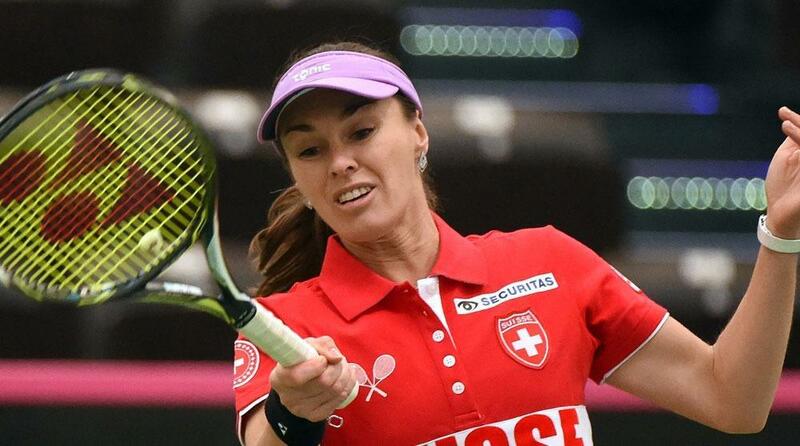 Martina Hingis rolled back the years on Sunday as her doubles win alongside Belinda Bencic sealed Switzerland's 3-2 win over Germany in their Fed Cup World Group first round-match. Teenager Bencic and Hingis, 35, who won her 12th Grand Slam doubles title in last weekend's Australian Open final alongside India's Sania Mirza, needed just over an hour to seal their 6-3, 6-2 win over Germany's Andrea Petkovic and Anna-Lena Groenefeld in Leipzig. Bencic won three points at the weekend to secure a semi-final place where the Swiss will take on either defending champions Czech Republic or Romania in April. Sunday's defeat was tough on Petkovic, who lost the opening rubber to Bencic on Saturday and was then stood down for Sunday's reverse singles when Annika Beck had levelled the tie at 2-2. Beck's 7-5, 6-4 victory over Timea Bacsinszky had given the Germans brief hope before Hingis and Bencic sealed the Swiss win. The 21-year-old Beck had rescued Germany after Angelique Kerber lost to teenager Bencic in Sunday's first singles rubber which had put the Swiss 2-1 up. Just eight days after beating Serena Williams in the Australian Open final, Kerber had few answers as she lost 7-6 (7/4), 6-3 to the 18-year-old. It had finished all square on the first day after Bencic, the world number 11, swept past Petkovic, 6-3, 6-4, then Kerber, ranked second in the world, got Germany back on track with a 6-1, 6-3 win over Bacsinszky.